Don’t let the back-to-school blues get you down! 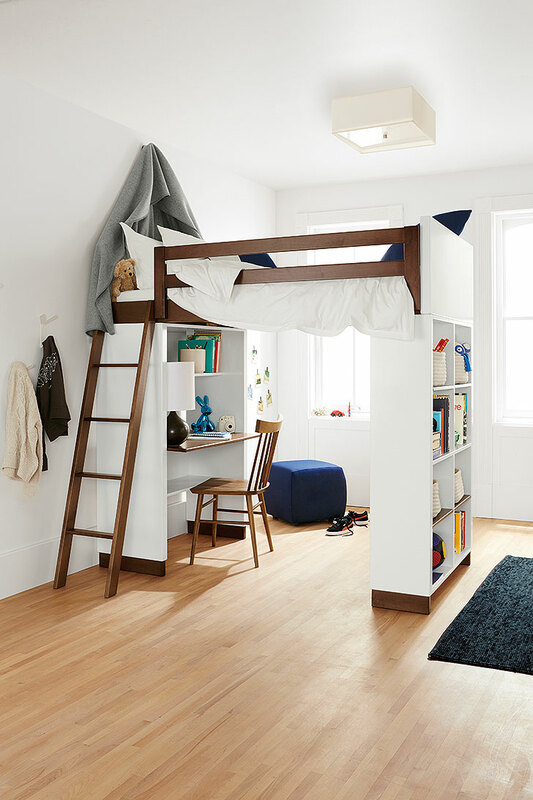 Creating kid-friendly workspaces helps your child’s organization. And while they may not love homework, they’ll love working in a designated space they can personalize. 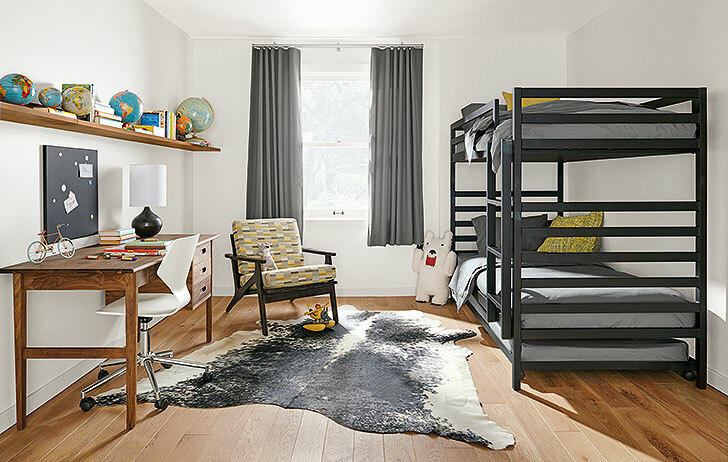 Our Moda loft with desk and dresser options gives kids of all ages a great space to spread out and work. It features a clever, space-efficient design with multiple desk and bookcase storage options. Crafted from solid maple and durable MDF, you can choose from wood finishes and an array of bright colors, so there’s something for every child. The kid-sized Perch table is a great place to play and create. Made to pair perfectly with our Perch chairs, the exclusive table has an easy-to-clean top and bright chrome legs. 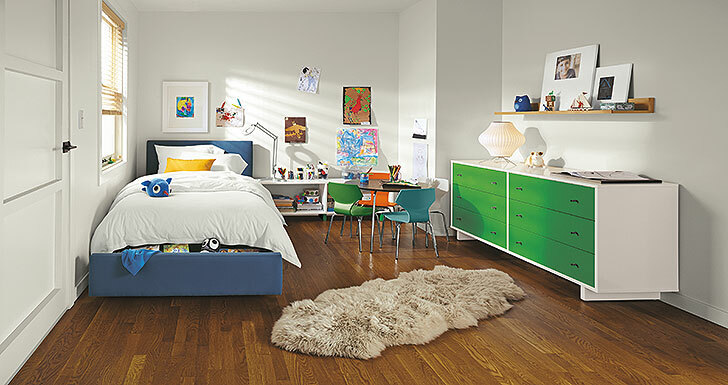 Our Moda office armoire brings modern, functional design to kids’ furniture. This sturdy cabinet includes a drop-down work surface, perfect for homework sessions. Crafted of solid maple and white MDF, you can choose from three wood finishes and an array of bright colors to bring personality to your kids’ work spaces. Our Henning desk is great for children and adults. Featuring drawers with carved pulls and soft curves, the Henning desk brings Danish-inspired design to your office furniture. Gracefully tapered legs and a simple design highlight the beauty of the wood, and a natural oil-and-wax finish enhances and protects the grain. From crayons to calculus, the Moda loft desk will see your kids through, thanks to its solid maple and white lacquered fiberboard construction. The modern style and durable lacquered finish ensure it appeals to kids of all ages. The Sherwood desk offers beautiful Arts and Crafts design at an outstanding value. Built by North Dakota woodworkers, each desk features solid wood and high-quality wood veneers sealed with a natural oil-and-wax finish. Plus, the Agenda magnetic board is made of natural steel and features a ledge along the bottom that serves as the perfect catch-all for small items. The Agenda board can also be a unique addition to a frame wall. This modern canvas creates a timeless, one-of-a-kind accent that’s great for home organization.